The Akai MPX225 Controller Keyboard is one of the keyboard controllers from Akai Professional providing hands-on music production capabilities with modern DAW control. 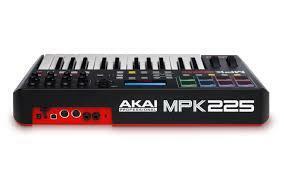 The MPK2 series features a full-size, semi-weighted keybed available in 25, 49 and 61-key models. With a slim, stylish design, the Akai MPX225 keyboard sounds professional and looks great. Experience expanded control of your VST instrument and effect collection with MPK225 and VIP3.0 (Free Download Included). VIP3.0 provides you with unparalleled access to your virtual instrument and effect collection, seamlessly integrating the hardware / software experience and grants the unrestricted freedom to create in a user-friendly, intuitive format. The combination of VIP and MPK225 maximizes workflow and ensures a playing experience that feels natural and enhances creativity – the natural, tactile feel of hardware fused with the unrivalled processing capability of virtual Instruments.